Inspired by trees often found along English riverbanks this bonsai has a gentle leaning trunk, horizontal twiggy branches with beautiful foliage. A wise old fisherman completes the scene. 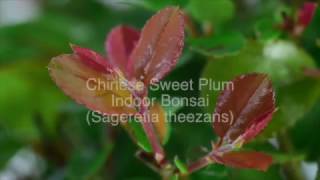 With lovely flaky bark and a character aged appearance, this beautiful Sweet Plum (Sageretia theezans) indoor bonsai has lovely leaves flecked with red and pretty purple fruits as it matures. Wonderful example of an informal upright bonsai. An outstanding indoor bonsai with beautiful proportions and artistic styling. Potted into a classic cream rectangular ceramic bonsai pot with matching drip tray - very tasteful. An ideal bonsai for beginners with leaves in perfect proportion to the trunk and branches. Free delivery is available to most areas and you can choose your delivery date at the checkout. This is a mature indoor bonsai, not fussy about positioning and ideal suitable for a beginner. An classic informal upright style Sweet Plum bonsai with highly defined foliage pads and extremely flakey bark, giving this tree a truly outstanding aged appearance. Classic cream ceramic pot with matching drip tray. The trunk flow is superb, it has clean and simple elegant lines which enhance the artistic appeal of this bonsai. A great bonsai for beginners, with free delivery to most of the UK. Full care instructions are always included and you may choose your delivery date at the checkout. * Pot details:Cream rectangular ceramic pot and matching drip tray.